You want to run a docker image build on Google Cloud Build, but the client is trying to upload a huge context image to Google Cloud even though you have added all your large directories to your .dockerignore and the build works fine locally. Google Cloud Build ignores .dockerignore by design – the equivalent is called .gcloudignore. This will ask you for your username and password. In case you have not registered yet on Dockerhub, register here! Now you can retry your command. Note that you do not need to create the repository on DockerHub explicitly, it will be created automatically! docker build -t eu.gcr.io/myproject-123456/pseudo-perseus:v1.0 . For reference see the official Container Registry documentation. WARNING: `docker-credential-gcloud` not in system PATH. gcloud's Docker credential helper can be configured but it will not work until this is corrected. gcloud credential helpers already registered correctly. ERROR: (gcloud.components.install) You cannot perform this action because this Cloud SDK installation is managed by an external package manager. Now you can retry running your original command. For reference, see the official documentation. How to fix ERROR: Couldn’t connect to Docker daemon at http+docker://localhost – is it running? ERROR: Couldn't connect to Docker daemon at http+docker://localhost - is it running? If it's at a non-standard location, specify the URL with the DOCKER_HOST environment variable. There are two possible reasons for this error message. The common reason is that the user you are running the command as does not have the permissions to access docker. and then logging out and logging back in completely (or restarting the system/server). This generator allows you to generate a systemd service file for a docker-compose setup that is automatically restarted if it fails. Now we need to edit /etc/sysctl.conf so the setting will also be in effect after a reboot. Copy and paste these command blocks into your Linux shell. You need to copy & paste one block at a time – you can paste the next block once the previous block is finished! sudo add-apt-repository -y "deb [arch=amd64] https://download.docker.com/linux/ubuntu $(lsb_release -cs) stable"
Note that this will install Docker as deb package whereas docker-compose will be downloaded to /usr/local/bin. This settings requires that you logout and log back in (or completely terminate your SSH session and open a new SSH session) in order to take effect. In case that does not work and you still get permission denied error messages try rebooting the computer you just installed Docker on. In a previous post I detailed how to install Redmine on Linux using the excellent Bitnami docker image. This post will teach you how to easily make an online backup of your Redmine installation. Note that automating the backup is not within the scope of this post. We assume that the redmine is installed as shown in my previous post in /var/lib/redmine. and that you want to backup to my.backup.server:~/redmine-backup/ using rsync. Note that old versions of files in redmine_data will be overwritten, however files that are deleted locally will not be deleted on the backup server. To me, this seems like a good compromise between the ability to recover deleted files and the used storage space. This part is slightly more complicated, since we need to access the MariaDB server running in a different container. Important note: The container ID can change so it is not sufficient to just find the container ID once and then use it. You need to determine the appropriate ID each time you do a backup. See below on instructions how to do that. docker exec -it (container ID) (command): Run a command on a running docker container. mysqldump -uroot bitnami_redmine: This is run on the docker container and dumps the Redmine Database as SQL to stdout. No password is neccessary since the Bitnami MariaDB image allows access without any password. xz -e9 -zc -: Takes the data from mysqldump from stdin (-), compresses it using maximum compression settings (-e9 -z) and writes the compressed data to stdout. > redmine-database-dump-$(date -I).sql.xz: Writes the compressed data from xz into a file called redmine-database-dump-(current date).sql.xz in the current directory. The resulting file is called e.g. redmine-database-dump-2019-02-01.sql.xz and it’s placed in the current directory. Ensure that you run the command in a suitable directory. Run it in /tmp if you don’t know which directory might be suitable. Since the filename contains the current data, this approach will not overwrite old daily backups of the database, so you can restore your database very flexibly. This post shows you how to install a custom theme like A1 (which I used successfully for more than 5 years) if you use the bitnami Docker image. We will assume that you installed redmine in /var/lib/redmine and your systemd service is called redmine. Note: If you get any permission denied errors, try running the same command using sudo. First, we need to create the themes directory. The first thing we need to do is to copy the current (default) themes to that directory, since Redmine won’t be able to start up if the default theme isn’t available in the correct version. From these lines, you need to select the line that says redmine_redmine_1 at the end. The one that lists redmine_mariadb_1 at the end is the database container and we don’t need that one for this task. From that line, copy the first column – this is the container ID – e.g. ae4de10d0b41 in this example. Now copy your custom theme (e.g. the a1 folder) to /var/lib/redmine/themes. At this point we need to edit the docker-compose config (in /var/lib/redmine/docker-compose.yml) to mount /var/lib/redmine/themes in the correct directory. This is pretty easy: Just add - '/var/lib/redmine-szalata/themes:/opt/bitnami/redmine/public/themes' to the volumes section of the redmine container. and set your new theme by selecting it in Administration -> Settings -> Display. Similarly to my previous article about installing Redmine via docker behind a reverse proxy, this article details. Since I am running an instance of Redmine and an instance of Gitlab on the same virtual server, plus tens of other services. While the Gitlab CE docker container is nicely preconfigured for standalone use on a dedicated VPS, running it behind a reverse proxy is not supported and will lead to a multitude of error messages – in effect, requiring lots of extra work to get up and running. Note that we will not setup GitLab for SSH access. This is possible using this setup, but usually makes more trouble than it is worth. See this article on how to store git https passwords so you don’t have to enter your password every time. After running this shell script, log out & login from the system in order for the docker group to be added to the current user. We will install Gitlab in /var/lib/gitlab which will host the data directories and the docker-compose script. You can use any directory if you use it consistently in all the configs (most importantly, docker-compose.yml and the systemd service). Set the SMTP credentials (gitlab_rails['smtp_address'], gitlab_rails['smtp_port'], gitlab_rails['smtp_user_name'], gitlab_rails['smtp_password'] & gitlab_rails['smtp_domain']) to a valid SMTP server. In rare cases you also have to change the other gitlab_rails['smtp_...'] settings. You need to change every 4 occurrences of gitlab.mydomain.de to your domain. The ports configuration, in this case '9080:80' means that Gitlab will be mapped to port 9080 on the local PC. This port is chosen somewhat arbitarily – as we will run Gitlab behind an nginx reverse proxy, the port does not need to be any port in particular (as long as you use the same port everywhere), but it may not be used by anything else. You can use any port here, provided that it’s not used for anything else. Leave 80 as-is and only change 9080 if required. Next, we’ll configure the systemd service in /etc/systemd/system/gitlab.service. Set User=... to your current user in the [Service] section. Job for gitlab.service failed because the control process exited with error code. See "systemctl status gitlab.service" and "journalctl -xe" for details. (if you changed the port config before, you need to use your custom port in the URL). Connecting to localhost (localhost)|127.0.0.1|:9080... connected. Connecting to gitlab.gridbox.de (gitlab.mydomain.de)|35.198.165.121|:443... failed: Connection refused. Since we have not setup nginx as a reverse proxy yet, it’s totally fine that it’s saying connection refused. The redirection worked if you see the output listed above. First, you’ll need a domain name with DNS being configured. For this example, we’ll assume that your domain name is gitlab.mydomain.de ! You need to change it to your domain name! First, we’ll create the config file in /etc/nginx/sites-enabled/gitlab.conf. Remember to replace gitlab.mydomain.de by your domain name! If you use a port different from 9080, replace that as ewll. Once you have fixed all errors, if any, run sudo service nginx reload to apply the configuration. It will ask you to enter your Email address and agree to the terms of service and if you want to receive the EFF newsletter. In this case, there is only one domain name (there will be more if you have more domains active on nginx!). Choose Redirect here: Type 2 and press enter. 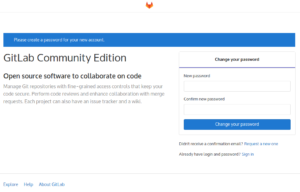 Now you can login to GitLab and finish the installation. You need to renew the certificate every 3 months for it to stay valid, and run sudo service nginx reload afterwards to use the new certificate. If you fail to do this, users will see certificate expired error messages and won’t be able to access Redmine easily! See this post for details on how to mostly automate this process! Set the new password and then login with the username root and your newly set password. After that, open the admin area at the top by clicking at the wrench icon in the purple navigation bar at the top. At the navigation bar at the left, click on Settings (it’s at the bottom – you need to scroll down) and then click on General. Click the Expand button to the right of Visibility and access controls. Scroll down until you see Enabled Git access protocols and select Only HTTP(S) in the combo box. Then click the green Save changes button. Since we have now disabled SSH access (which we didn’t set up in the first place), you can now use GitLab. A good place to start is to create a new project and try checking it out. See this article on how to store git https passwords so you don’t have to enter your git password every time. to GITLAB_OMNIBUS_CONFIG. See this file on GitHub for more Let’s Encrypt-related configs you can add. Note: Also see this followup post on how to use custom themes in this setup and this followup post on how to backup Redmine using this setup. We will install redmine in /var/lib/redmine which will host the data directories and the docker-compose script. The ports configuration, in this case '3718:3000' means that Redmine will be mapped to port 3718 on the local PC. This port is chosen somewhat arbitarily – as we will run redmine behind an nginx reverse proxy, the port does not need to be any port in particular (as long as you use the same port everywhere), but it may not be used by anything else. You can use any port here, provided that it’s not used for anything else. Leave 3000 as-is and only change 3718 if required. Note that you do not need to change REDMINE_PASSWORD – when you login for the first time, redmine will force you to change the password anyway. Next, we’ll configure the systemd service in /etc/systemd/system/redmine.service. Job for redmine.service failed because the control process exited with error code. See "systemctl status redmine.service" and "journalctl -xe" for details. The first startup usually takes about 3 minutes, so grab a cup of coffee. First, you’ll need a domain name with DNS being configured. For this example, we’ll assume that your domain name is redmine.techoverflow.net ! You need to change it to your domain name! First, we’ll create the config file in /etc/nginx/sites-enabled/redmine.conf. Remember to replace redmine.techoverflow.net by your domain name! If you use a port different from 3718, replace that as ewll. Choose Redirect here: Type 2 and press enter. Now you can login to redmine and finish the installation. Go to your domain name (if you have followed the instructions above, it should automatically redirect you to HTTPS). Click Login at the top right and login with the username admin and the default password redmineadmin. Upon first login, it will require you to change the password to a new – and more secure password. Scroll down to the bottom of the Email Notifications page and click Send a test email which will send a test email to the current redmine user’s email adress. Unless you have changed it, the default is the address configured in REDMINE_EMAIL in /var/lib/redmine/docker-compose.yml. which will use the new configuration from the config file. ufw is a simple Firewall for Ubuntu. Use sudo apt install ufw to install it and sudo ufw enable to activate it. The default configuration will allow SSH but it will block other ports, including port 3718 or any other custom port you might have used. Remember to add any ports you need to have open to the list as well. See the ufw docs for more information. The -d option means --detach, i.e. the process is detached from the foreground shell you are running. on the host directories used by both the MariaDB container and the Redmine container. Set the correct path for your docker-compose YML config file in all the Exec…=… lines (i.e. replace /home/uli/mydockerservice/docker-compose.yml by your YML path). systemctl enable docker # Docker is required for your service so you need to enable it as well! As the error message already tells you, the docker daemon is currently not running. After that, run your command (e.g. docker ps) again. As a quick fix, running the command as root (sudo docker ps) will solve the issue temporarily. After that, you need to log out from the server/computer (e.g. end the SSH session) and log back in. uli sudo www-data lxd docker # Check if docker appears here! How to list all currently running docker containers?